This ‘plan’ goes back much further than just the previous administration. The destruction of our Constitutional Representative Republic began right after it was formed. Civil War was orchestrated by Great Britain to bankrupt our country to capture us through DEBT and this is what started the destruction of the United States of America. Our Constitution FOR the United States was replaced with the Constitution OF the United States incorporated, USA INC.
JFK was murdered because he learned of the communist plan to destroy our country after WWII, did not agree. He was going to dismantle the ‘agencies’. 9/11 was used to introduce marxist communism via the Patriot Act, NDAA, TSA, DHS, & NSA. DHS declared a 100 mile Coastal Border around our country to be a CONSTITUTION-FREE ZONE. This made all of Michigan & Florida Constitution-Free. We’re in big trouble if WE the PEOPLE don’t snap out of it and take ACTION to stop this invasion. UN SMALL ARMS TREATY was to disarm us and why Barry Soetoro desperately tried to nullify our Second Amendment using riots and false flags. 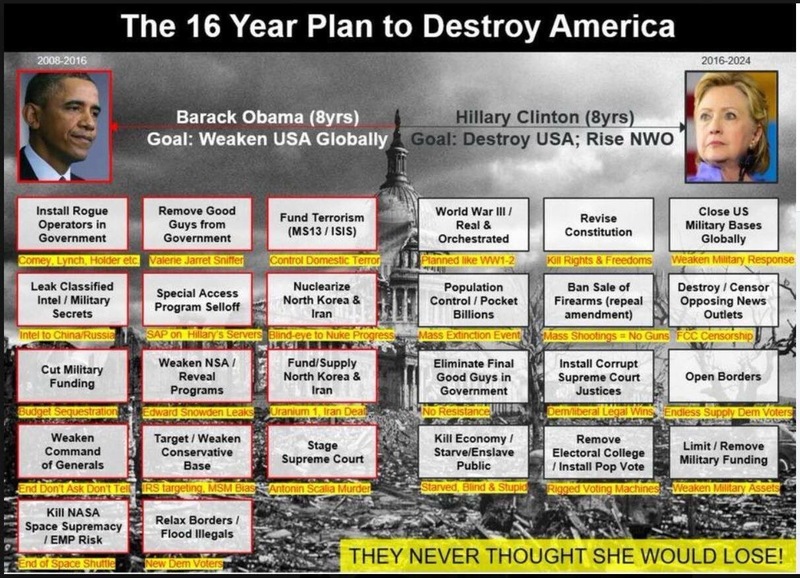 The 16 year plan was to be final marxist/communist/Islamist thrust take-down for their GLOBAL CONTROL, and this THRUST is still activated and being used to OBSTRUCT President Trump. RESEARCH our true history & events that brought us to this point in our history instead of listening to others give you their opinions from listening to MSM or indoctrinated university minions. About 90% of EVERYTHING is FALSE. Thank you and God Bless All!